With Flappy Bird having been pulled from both the App Store and Google Play though not yet Twitter, if the past few days are anything to go by  the industry is starting to come to terms with its brief but bombastic run at the top. Analytics specialist Distimo has published Flappy Bird data it had been tracking since the game's debut, with the firm claiming it's been able to pin down the two mammoth days in the title's short history. 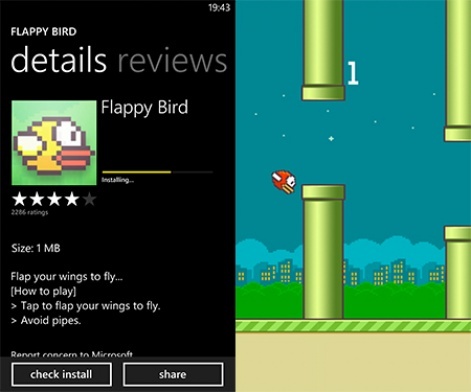 With the game having originally launched at the end of May 2013, Distimo claims 16 November was the day when Flappy Bird first began to make its mark in the US, initially gaining traction on the iPhone's family chart. 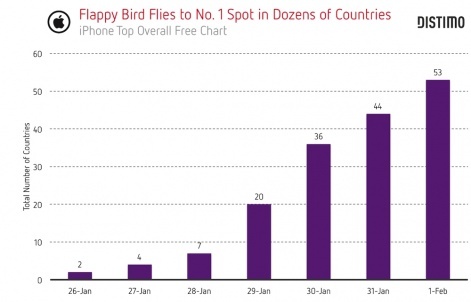 "Nearly a month later, on December 13, 2013, Flappy Bird began to rank on the US iPhone top overall free chart," details Distimo on its blog. "On Flappy Bird's flight path to No. 1, the game saw a significant swell in downloads on January 13. On that day, downloads increased 136 percent day-over-day (see chart above). By January 17, Flappy Bird was the No. 1 app on the US iPhone top overall free chart, and it has remained No. 1 every day since then." 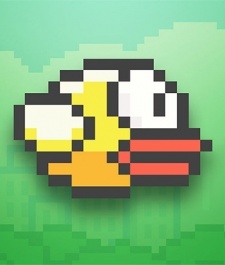 The second big day in the game's history came with Flappy Bird began to take off outside of the US. "On January 26, Flappy Bird was the No. 1 app on the iPhone top overall free charts in only the US and Canada, with 97 percent of its total global downloads (launch to January 26) coming from just those two countries," adds Distimo. "A week later (February 1), Flappy Bird was the No. 1 app on the iPhone top overall free charts in 53 countries (chart below) like the UK, Brazil, and Singapore, with 82 percent of its total global downloads coming from the US and Canada." The game has, of course, now been pulled from sale, with numerous clones having popped up across mobile platforms both before and after its departure  including, most notably, an attempt at a direct port for Windows Phone. Vietnamese developer Nguyen Ha Dong claimed on Twitter that the pressure created by Flappy Bird's success had been too much for him to handle. Since announcing his plans to pull the game from the market, he's also been flooded with death threats from scores of Twitter users. Questions are now being asked as to whether Dong was bullied into dropping support for the game, and what role the games press - and the wider development community - had to play in Flappy Bird's demise. I find it interesting that Dong did not remove Super Ball Juggling or Shuriken Block. Surely if he removed Flappy Bird due to all the negativity then he would have removed all his games to make a clean break of things. He was receiving very negative tweets about the other games too. Another scenario that comes to mind. Many people suspect Dong used a bot net to game the App Store and get Flappy Bird up the charts. Perhaps Apple found evidence of this and gave him the option to remove it, but keep the other games in the store or else shut down his account completely. Don't you just love a good conspiracy theory?